Join noted local cook, author and restaurant owner Su-Mei Yu as she explores and cooks her way around San Diego while sharing captivating tales of our culinary bounty. Su-Mei visits a local sake brewer to learn how to make sake then visits an area Japanese restaurant that specializes in authentic sushi to discover delicious sake pairings. Su-Mei discovers that there’s more to Julian than just apple pie. 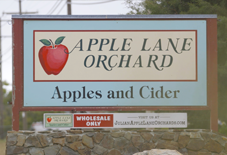 On this episode she visits a variety of foodie destinations in the quaint nearby town of Julian including a brewery, vineyard and cider producers.